The bachelor’s degree, emphasizing general educational preparation, represents a first step in preparing students for careers as information professionals. By combining a major in information science with an area of special interest in the context of new information technologies, students may be qualified for a variety of positions in information centers, bibliographic utilities and networks, information industry companies, and specialized publishing, abstracting and indexing services. The BS in Information Science is also available partially online. Students who are intent upon pursuing careers as information professionals should be prepared to undertake an additional year of study to earn the master’s degree. It is the master’s degree that is recognized as the basic professional degree and that is normally required for professional positions and continuing advancement in the field. The master’s degree may be completed on a part-time basis, during which students may be employed in paraprofessional or other positions. Note: Undergraduate students should be sure to check out the Grad Track Program as an option to pursue an accelerated pace toward the graduate degree. The Bachelor of Science in Information Science and Applied Technology at UNT is designed to equip graduates with the knowledge needed to build competencies in important and emerging areas such as information organization, information architecture, information seeking and use, health informatics, knowledge management, digital content and digital curation, and information systems. The Bachelor of Science with a major in information science and applied technology is a flexible program offering a wide range of concentrations, including technological fields, making you more marketable. Concentrations or minors chosen by students in this program often become an area of specialization for graduate study. The bachelor's degree prepares students for a career at the intersection of information, people and technology. The continuous growth of information and technology innovation has led to a host of related trends and issues, including social media, security, privacy, digital divide, information literacy, open access, digital curation and more. With the need to address these issues comes the importance of educating a new generation of information professionals who not only have the can-do attitude but are also flexible, innovative, entrepreneurial and progressive. Students earning this degree can customize their program by developing focused areas of studies (concentrations) or by choosing a minor or certificate in another field. The flexibility built into the BSIS&AT program prepares graduates for the varying career options available in the information profession. 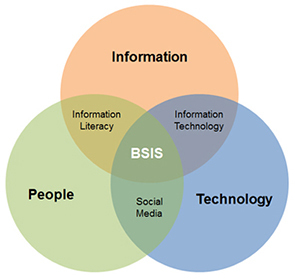 A key component of the BSIS program is its flexibility. Instruction is offered in a variety of formats, including face-to-face, online and blended, that allows you to balance classes with full-time or part-time employment. Special lectures hosted by the college and the department, feature renowned scholars who provide different perspectives and insights into the information science field. Our students and faculty are active members of different professional associations and learned societies, such as the iSchools consortium, the American Library Association, the American Society for Information Science and Technology, and the Knowledge & Information Professional Association.